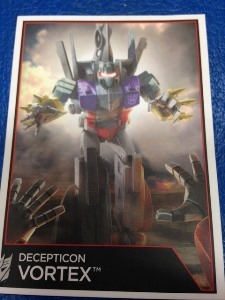 Decepticon Vortex is the interrogator the Decepticons call when they need someone to cough up information. He�ll take his targets for a wild ride, twisting, turning, looping, and diving through the sky. It�s enough to make any bots cough up their secrets� and then some. I can�t tell you how many times I passed on this guy and thought that he was just plain ugly. Some of that feeling still lingers, but it�s softened a bit over time. Vortex is a pretty good toy all around, minus the garish color palette. Even so, he mimics the original toy quite well; truth be told, I only bought him to complete Bruticus. This version of Vortex is a repaint of CW Alpha Bravo, and a repaint/retool of CW Blades. Vortex�s alternate mode is a military helicopter. The mode is rather sleek and features good molded detail. 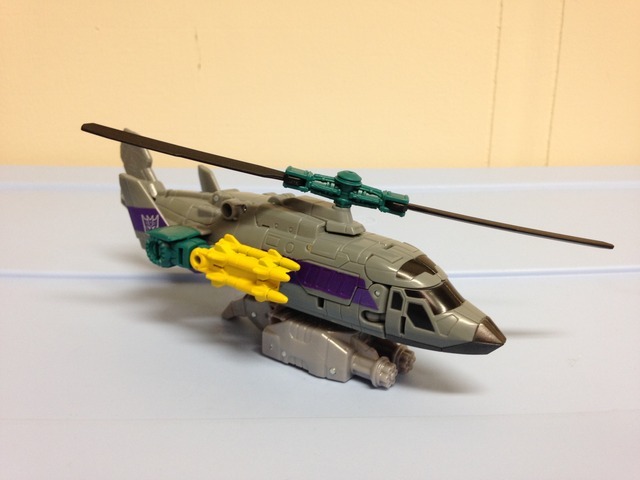 Most of the garish color palette is hidden by grey while in helicopter mode, and I think it works rather well. Aesthetically, the downside is the arms aren�t hidden very well on the helicopter sides. The missile racks on the forearms do a little to obscure this, but they stick out a bit too much for my liking. It�s definitely not a deal breaker, and something that can easily be overlooked. Otherwise, the paint applications are clean and crisp, and there�s a good amount of molded detail all over the helicopter mode that should please most people. The rotors spin well, and don�t typically bump into anything when he�s transformed properly. The blades are a little too �bendy� in my opinion, but I suppose that helps them from being snapped during play. You can tab Vortex�s gun into the helicopter side for storage and for a bit more armaments. Vortex does not come with any landing gear to speak of, so setting down the helicopter happens either on it�s belly, or thankfully with the included combiner weapon. With all of my combiner figures so far, the combiner weapon has been a part I leave out if they�re not combined. With Vortex, however, the hand/foot has two fantastic Gatling guns on the bottom, so it fits in nicely with the military helicopter mode, and gives him some �landing gear� to work with. In this case it�s a very nice inclusion. Like almost every other CW figure on my shelf, Vortex features a rather simple, yet effective transformation. You won�t find any surprises, and you�ll find the same leg mechanics at play that can be found with Blast Off (and Quickslinger and Firefly) or Ironhide (and Trailbreaker and Off-Road). Everything tabs in nicely from mode to mode, and you�re left with a pretty sturdy robot. 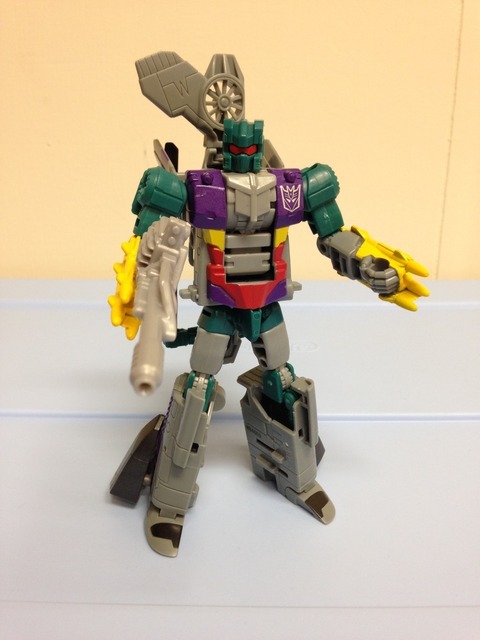 Aesthetically, Vortex has a lot more purple, teal, and yellow in his robot mode. As an added bonus, you get a little red thrown into the mix in the abdomen and visor. In my opinion, it�s rather garish, but it is a good mimicry of the original toy. The molded detail is done well, and again, paint apps are crisp. Vortex is much like the other CW figures in that he has a great range of motion. Between swivel and ball joints everywhere, you can get Vortex into a variety of positions with relative ease. Weight distribution is done well enough to not make him heavy in any spot. The only issue I have is in the hips � it�s not that they don�t have good range, but the ones on mine don�t fit quite right. The ball joints are loose in spots and really tight in others, so keeping him in certain positions can be a chore, and the legs tend to pop off. Otherwise I feel that the quality is good and you can do a lot with Vortex. Overall, Vortex is a pretty solid toy, ugly coloration and all. A good range of motion, some decent weapons, and a good heli mode make for some good fun. 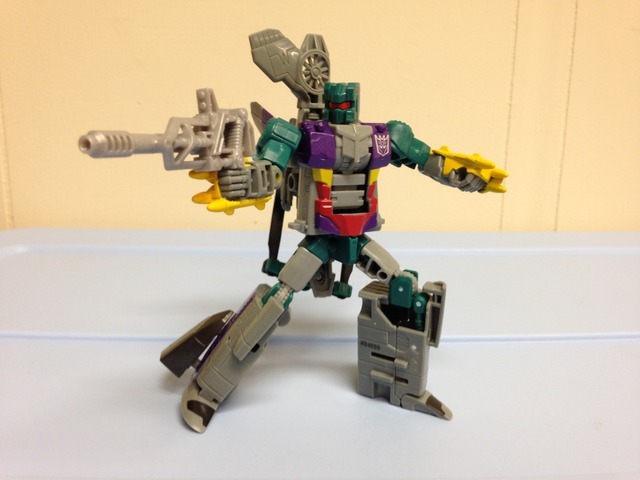 If you add him into a complete Bruticus set, he works very well. Transformation Design: 5. Average and simple. Durability: 8. Good quality plastic, but the hips are a bit off. The rotors are bendy enough to avoid breaking. Fun: 8. Vortex is really good within a complete combiner set. Otherwise, he�s just average. Aesthetics: 5. His coloration bugs me, but it�s close to the original. The detail is nice and paint apps are crisp when present. Articulation: 8. Ball and swivel joints are plentiful, and really nothing is hindered. Value/Price: 7. I got Vortex at a discount, which made me happy. At normal MSRP, this really isn�t as high of a score � more like a 5. Overall: 6. As part of Bruticus, Vortex is a nice piece to have. If you can only get Vortex, you really should think twice. I don�t think he�s that good on his own.